“Funny thing, nobody asked me about my pitching,”1 said the hurler best remembered as the only pitcher to hit two grand slams in one game. Yet Tony Cloninger was much more than a great hitting pitcher. 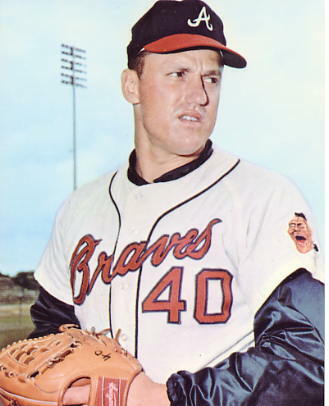 In the waning days of Warren Spahn’s great career, the Milwaukee Braves looked to Cloninger to step into the role of staff ace – and he responded accordingly, pacing the team in wins for three consecutive seasons. Then at the age of 26 Cloninger went through a series of injuries and ailments from which he never fully recovered. But for a period of time in the mid-1960s, Tony Cloninger’s name was mentioned prominently among the great pitchers in the National League. Tony Lee Cloninger was the fourth child born to Carl E. Cloninger and his wife, Edna (née Lynch) on August 13, 1940, in the rolling terrain of Lincoln County, North Carolina, northwest of Charlotte. A farming family blessed with considerable baseball genes – an older brother passed on a potential professional career, and two of Tony’s sons went on to play professionally in the 1980s – Tony started in the game on the receiving end of fastballs until coaches took note of his powerful arm and moved him from behind the plate to the mound. The move reaped success when Tony led his American Legion squad to the state finals in 1957. He attracted considerable big-league attention, and a family friend helped narrow that interest to the Braves, Cubs, Reds, and Giants. Cloninger signed with Milwaukee in the spring of 1958, and when Giants scout Tim Murchison was informed of the decision, he raced 300 miles west to ink another North Carolina native, Gaylord Perry. Still two months away from his 18th birthday, Cloninger made his professional debut in Midland, Texas, where he led the Braves of the Class D Sophomore League to an 11-3 victory. Two days after his birthday, Tony garnered his seventh win before Braves general manager John Quinn (who was there to evaluate both Cloninger and Paul Dean Jr., the son of Paul “Daffy” Dean and nephew of Dizzy Dean). Quinn was impressed enough to approve a promotion to the Class C affiliate in Eau Claire, Wisconsin in the Northern League, where a case of wildness (a career-long challenge) befell the youngster – he yielded 33 hits and 40 walks in 35 innings of work. Tony was then shuttled to the Florida Winter Instructional League where, in spite of a sore arm that sidelined him for an extended period, he developed an effective slider and changeup to add to his repertoire. The next year opened to another promotion for the burly righty as he reported to the Class B affiliate in Cedar Rapids, Iowa. Ten starts produced a terrible 0-9, 9.59 mark with an equally bad 58 walks in 46 innings which prompted a demotion to the Class C Pioneer League. (Ironically, Tony was feted by Cedar Rapids seven years later as the city’s top “graduate” following the success garnered in the 1965 season in Milwaukee.) Cloninger regained his footing immediately with a 16-strikeout, four-hit performance over Idaho Falls, and later established a league record 30? consecutive scoreless innings, contributing to a first-place finish for the Boise Braves and a spring-training invitation for his efforts. Cloninger was not alone in the parent club’s desire to get an early look at their prospects – youngsters Denny Lemaster and Phil Niekro would also receive spring auditions, and for very good reasons. Team ace Warren Spahn was 39 years old, and they sought to groom a future replacement from this corps of young hurlers. Cloninger’s efforts resulted in a promotion to Class A Jacksonville. Arm problems contributed to a pedestrian mark of 4-4, 6.66, and he was sent to Milwaukee for treatment. When Tony responded positively, he was sent instead to the Double-A Austin Senators (Texas League), where it was hoped that the dry heat would be better for his arm. A home run by Cloninger contributed to his own cause in a five-hit gem on August 14, promptly followed by a four-hit shutout over the San Antonio Missions. He concluded the campaign with eight wins and 11.5 strikeouts per nine innings. Tony then reported to the Instructional League, where his team won the league championship and he was named to the All Star squad. In the spring of 1961 Cloninger made a strong bid for retention by the parent club. Reportedly “one of the most effective pitchers on the staff … Cloninger was a disappointed young man when the Braves turned him over to their Louisville [Triple-AAA affiliate, but as Braves manager Chuck] Dressen explained, ‘I don’t want him sitting around.’ ”3 A slow start to the season was more than made up for with a four-hit shutout over Indianapolis on May 31, and 15 days later Tony made his major-league debut. The Braves were beginning to show the weariness of an aging team – the fourth-place finish was their lowest in nine years. One area of concern was pitching, where the team had seen a steady rise in ERA for three straight seasons. After a poor outing on June 9, Cloninger was inserted into struggling Bob Buhl’s next starting assignment. On June 15 Cloninger took the mound in Candlestick Park and set down the first six Giants he faced – including a strikeout of Willie Mays. But Willie McCovey contributed to Cloninger’s demise with a two-run blast in the third inning that handed the 20-year-old his first defeat. Despite an unsightly 7.19 ERA after ten appearances (including five more starts), Tony was still roundly lauded: “[he has] the poise of a veteran and a world of stuff to go with it. He also ha[s] one of the best fastballs in the league.”4 Then, beginning on August 6, the talent simply clicked in. Excluding two innings of relief work, Cloninger concluded the season with five straight wins accompanied by a 2.66 ERA. By that winter the Braves made no secret of their desire to trade Buhl and insert Cloninger permanently into the rotation. A shoulder ailment impeded Cloninger for much of the 1962 campaign – a mere 48 innings of work entering August. Once fully recovered, he again turned in a worthwhile late-season performance – 6-1, 3.02 – that included his first major-league shutout, a five-hit blanking of the St. Louis Cardinals. As the team embarked increasingly toward a youth movement, management could only hope that a healthy Cloninger would be around to take his consistent turn in the rotation going into the next season. Cloninger entered 1963 with a combined 15-5 mark over portions of two campaigns that, combined with a sterling spring, seemingly called out for a starting spot. Surprisingly, new manager Bobby Bragan reversed course from the orientation on youth, and Lemaster and Cloninger did not become a regular part of the rotation until May and June, respectively (in Tony’s case, not until veteran Lew Burdette was traded to the Cardinals). Once inserted, Cloninger won six of eight starts that included two straight shutouts – the second of which was a two-hit gem over the Los Angeles Dodgers in which he faced only 28 batters. This was followed by two masterful performances in August against St. Louis and Houston in which the only runs he yielded were unearned. Three straight losses in September marred an otherwise decent season for the 22-year-old as he finished the campaign with a record of 9-11, 3.78. No aging veteran stood in Cloninger’s path in 1964 and he posted one of his finest seasons in baseball. With 19 wins and a 3.56 ERA, he was one of the few bright spots on a team that witnessed a near-complete collapse from the mound. A franchise that thrived on pitching, the Braves were spared a league-worst ERA by the hapless New York Mets, while the 4.12 mark was the team’s worst since 1950, when they played in Boston. Cloninger and Lemaster (17 wins) accounted for more than 40 percent of the team’s 88 victories. Tony’s 15 complete games made up one-third of the team’s total. Cloninger was consistent from the start, and much credit was given to pitching coach Whitlow Wyatt. “I had better control of my breaking pitches,” Cloninger said. “[Wyatt] changed my motion just slightly and it helped my control a lot.”5 He barely missed a no-hitter against the Pittsburgh Pirates on April 29 when Willie Stargell stroked a two-out single in the seventh inning. (Five of Tony’s 19 victories in 1964 were against Pittsburgh.) On August 21 he took a perfect game into the sixth inning against Houston, but lost because of shoddy fielding and lack of run support. In six of his 14 losses that season, he had a combined 1.50 ERA and any measure of backing from the offense in the six games would have ensured a 20-win campaign. Still, the 19 wins served notice that with the waning of Spahn, the 23-year-old Cloninger had established himself as the staff ace. This success would pale in comparison to what lay immediately ahead. For only the second time in nine years, the Braves did not begin the 1965 season with Spahn on the mound – he had been sold to the Mets in the offseason. For the first time in his professional career, Cloninger took the mound for an Opening Day assignment. He proved himself worthy by hurling a two-hit victory over the Cincinnati Reds, and he proceeded to win nine of his next 13 decisions. The run support, lacking the season before, was there now, and it was crucial to some of these victories, as the wildness from his early minor-league career returned – he led the league in walks and wild pitches this season and the next. A near month-long drought produced four straight losses, but beginning with a victory over the Mets on July 18, Cloninger reeled off a 14-3 mark that resulted in the most wins ever (24) by a Milwaukee pitcher (through 2012) and ties him with Johnny Sain (1948) and John Smoltz (1996) for the most wins by a Braves hurler since 1914. There was at least one bright spot for Cloninger that season. The Baseball Hall of Fame’s holdings include a Denis Menke model bat that he used on July 3 in San Francisco’s Candlestick Park to hit grand slams in the first and fourth innings and etch his name in the baseball record books. He became the first National League player to hit two slams in a game, and his nine RBIs (the ninth came on an eighth-inning single) tied the record for a major-league pitcher through 2016. The final score was 17-3. This followed by 18 days a two-home-run, five-RBI game in a 17-1 victory over the Mets. As of 2016 Cloninger remained one of only three National League pitchers – Don Newcombe and Rick Wise being the others – to hit two home runs in one game twice in a season, and the only pitcher to hit two grand slams in a game. A bat was never a foreign object in the hands of this right-handed hitter – Tony was often slotted eighth in the batting order over some of his weaker-hitting teammates, and just as often used in pinch-hitting roles – but he himself likely never predicted such an offensive display. A 23-9 finish to the 1966 campaign brought hopes of pennant contention for the Braves as they entered the 1967 season. Instead the franchise’s first sub-.500 season in 15 years – a seventh-place finish – was fueled by a collapse of the league-leading offense of the preceding year. The long absences of Cloninger did not help matters. Reporting to West Palm Beach, Florida, that spring, both Tony and management had great expectations. After he arrived in camp ten pounds lighter, pitching coach Whitlow Wyatt raved about Cloninger’s brilliant spring output: “[Tony is] throwing loose and easy. … [I]t’s as good as I have ever seen [him] throw.”8 With a 1.89 ERA in his first 19 innings of work, Cloninger exhibited why the team had such high expectations. But it was six weeks before he twirled his 20th inning. Initially he was shelved by a muscle pull below his right shoulder. This was quickly followed by an eye ailment called ocular histoplasmosis syndrome, a malady evolving from a fungal infection). Fears of potential blindness were averted, and the ailment went away, but it reappeared on July 30 and he missed another month. Then he missed the final 20 games of the season with a sore elbow. In all he lost more than 90 days to injury and pitched just 76? innings in 16 games with a 4-7 record and a 5.17 ERA. “If Tony Cloninger can win 20 games [again] we can win this thing,” said Braves third baseman Clete Boyer in the spring of 1968, adding, “Tony is the key to our season.”9 But a poor spring relegated Cloninger to the deep recesses of the bullpen – he had only 19 innings of work one-third into the season – and on June 11 he was sent to the Cincinnati Reds in a six-player deal. “I expected it,” said Cloninger. “I wasn’t pitching [in Atlanta], so I figured I would probably be traded.”10 Joining the Reds, he was immediately inserted into the pitching rotation, but because of his lack of work at Atlanta he struggled, going 0-2 with an 8.33 ERA after six starts. “Give him time,” said manager Dave Bristol. “[Tony] hasn’t pitched much. He’s still going through spring training.”11 The manager’s patience bore fruit beginning July 21 with a victory in Philadelphia, and Cloninger was 4-1 with a 2.23 ERA the rest of the way (he was forced to sit out the final 12 games due to a tender elbow). His late-season comeback included his first shutout in more than two years, followed by another, an 11-strikeout blanking of the Phillies. The Reds were so convinced of the successful return of the “old Cloninger” that they included him among the 15 players protected in the expansion draft that October. In 1969 Cloninger started 34 games, the most since his first year in Atlanta. In his first two outings the Reds were shut out by Atlanta’s Phil Niekro, and aside from an infrequent strong outing that included his 100th major-league victory, Cloninger struggled much more than his 11-17, 5.03 season record would reflect. In his 17 losses he had a 7.91 ERA. In spite of this, Bristol continued to show his faith in Cloninger, and the righty made more starts than any Reds pitcher except Jim Merritt. After the season Bristol was fired and Cloninger had a new manager, Sparky Anderson. When Cloninger reported to Tampa for spring camp in 1970, he faced competition from two newcomers, Jim McGlothlin and Wayne Simpson, whose work eventually relegated him to long relief. A propensity to yield home runs – seven in less than 25 innings of work – helped lead to a 7.03 ERA for the first half of the season. Suddenly, while on his way to a 20-win campaign, fellow pitcher Merritt hit a rough stretch in July and Anderson turned to Cloninger for a few starts. He did well, and after teammate Wayne Simpson was sidelined with an injury, Anderson kept Cloninger in the rotation, where he remained the rest of the season. He curbed his home-run yield – surrendering only three in 123 innings – and contributed eight wins with a 3.20 ERA in 18 starts. With Cloninger’s contribution and those of the other members of the rotation, all of whom won at least 14 games, with Merritt winning 20 and Gary Nolan winning 18, the Reds raced to 102 wins. Cloninger started the third and deciding game in the National League Championship Series sweep over the Pittsburgh Pirates and gave up two runs in five innings (Milt Wilcox got the victory.) The Reds lost the World Series to the Baltimore Orioles in five games. Cloninger started Game Three and lost it, giving up five runs in 5? innings. He pitched two innings of mop-up work in the O’s decisive Game Five victory. In April 1971 Cloninger again was placed in the starting rotation while Merritt and Simpson recovered from arm problems. When they returned he was switched to long relief. (Anderson lamented having “to bypass … Cloninger, who has been the Reds’ most consistent pitcher since the beginning of spring training.”12) He made an occasional start and got his first complete-game victory in nearly two years when he shut out the Montreal Expos on June 29. That four-hit gem was Cloninger’s last major-league start. During the offseason it was quickly apparent that Cloninger no longer fit into Anderson’s plans. With the acquisition of right-hander Jack Billingham in November, the Reds actively shopped Cloninger. No deal was worked out over the winter, and Cloninger again reported to Tampa for spring training. On March 24 he was traded to the St. Louis Cardinals for infielder Julian Javier. With the recent acquisition of Rick Wise and an aging but still effective Bob Gibson, there was little room for Cloninger in the Cardinals’ rotation, and he was assigned to long relief. Lacking consistent work, he was ineffective –29 hits and 19 walks in 26 innings. On July 22 he entered a game at Atlanta and gave up a walk-off home run to Dusty Baker on his first pitch. Four days later he was released. Cloninger signed with the Braves and was assigned to Triple-A Richmond, where he closed out the year. After the season he ended his playing career. Cloninger returned to his native Lincoln County, where years earlier he’d purchased farmland adjoining his parents’ property. During his playing career Cloninger sometimes spent offseasons working as a sheriff’s deputy in a nearby county, but when he returned this time he and his brother began raising horses. Tony occasionally found time to pursue his other passions, quail and raccoon hunting. In the small community of Iron Station, North Carolina, he and his wife, Millie (née Dellinger), raised their four children. The two youngest boys, Darin and Michael, were selected in the June 1983 draft by San Diego and Minnesota respectively, and both played two years in the minor leagues. Tony and Millie were divorced in the mid-1980s. In 1988 Cloninger returned to baseball as a pitching coach with the Albany Yankees in the Eastern League, and later served under managers Buck Showalter and Joe Torre as a bullpen coach for New York. In the early 2000s he was a pitching coach for the Boston Red Sox. After a successful battle with bladder cancer Cloninger returned to the Red Sox as a consultant in player development. These ventures should have been no surprise: Teammates and management held him in great esteem throughout his playing career. When he was traded to Cincinnati in 1968, Braves general manager Paul Richards offered Cloninger a position with the organization after he retired. Joe Torre once said, “If desire were ability, Tony would already be in baseball’s Hall of Fame.”13 In 2004 Cloninger was inducted into the North Carolina Sports Hall of Fame. One of Cloninger’s managers, Bobby Bragan, said, “Control has been Cloninger’s major trouble. … [I]f he can find control, nobody would be better.”14 Throughout most of his career, Cloninger was prone to issue many walks and throw wild pitches. But few in his era could match Cloninger’s velocity. He is remembered most often for an incredible hitting display in 1966, but it shouldn’t be forgotten that Cloninger’s fastball was one of the most respected and feared among hitters of his time – truly a talent far more than just a good hitting pitcher! The author wishes to thank J.G. Preston for his help in determining the all-time Opening Day strikeout record. 1 “Hats Off: Tony Cloninger,” The Sporting News, July 16, 1966, 41. 2 “Cloninger Exchanged Mask for Toeplate,” The Sporting News, June 26, 1965, 5. 3 “Longshot DeMerit Cops Tepee Sweepstakes in Center Garden,” The Sporting News, April 19, 1961, 16. 4 “Kid Cloninger Shapes Up as Classy Curver of Braves,” The Sporting News, July 12, 1961, 18. 5 “Modest Tony Shuns 20-Win Forecast – Goal: Braves’ Flag,” The Sporting News, March 13, 1965, 22. 6 “Cloninger Preparing To Repeat as Braves’ Fast-Finish Winner,” The Sporting News, July 9, 1966, 18. 7 “Cloninger Testing Altered Style,” The Sporting News, March 11, 1967, 23. 8 “Bruce Gnashes His Bicuspids Over Hatton Spitter Charge,” The Sporting News, April 8, 1967, 17. 9 “Cloninger Called Key in Brave Bid To Shed Legirons,” The Sporting News, April 6, 1968, 22. 10 “Tony’s Arm and Eyes Okay Again,” The Sporting News, June 22, 1968, 16. 11 “Bristol’s Patience Plus Lots of Work Pay Off for Tony,” The Sporting News, August 24, 1968, 8. 12 “Merritt and Simpson Back on Reds’ Hill,” The Sporting News, May 8, 1971, 26. 13 “Bristol’s Patience Plus Lots of Work Pay Off for Tony,” The Sporting News, August 24, 1968, 8. 14 “Cloninger Points to Torre In Wild-Pitch Discussion,” The Sporting News, August 20, 1966, 13.